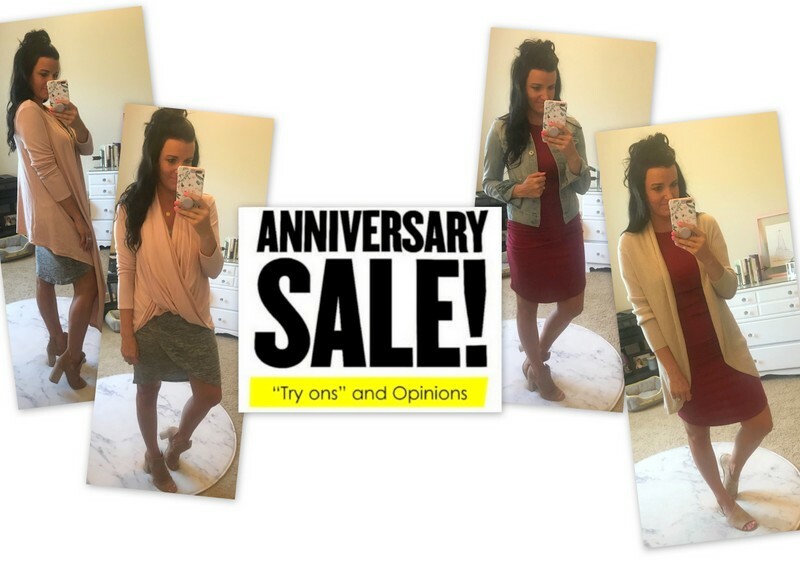 The Nordstrom Anniversary Sale is here, and honestly this year, I felt like I went into it with a few specific things on my mind: dresses and basics (like cardigans/camis). It finally goes public tomorrow super late (midnight PST to be exact!) 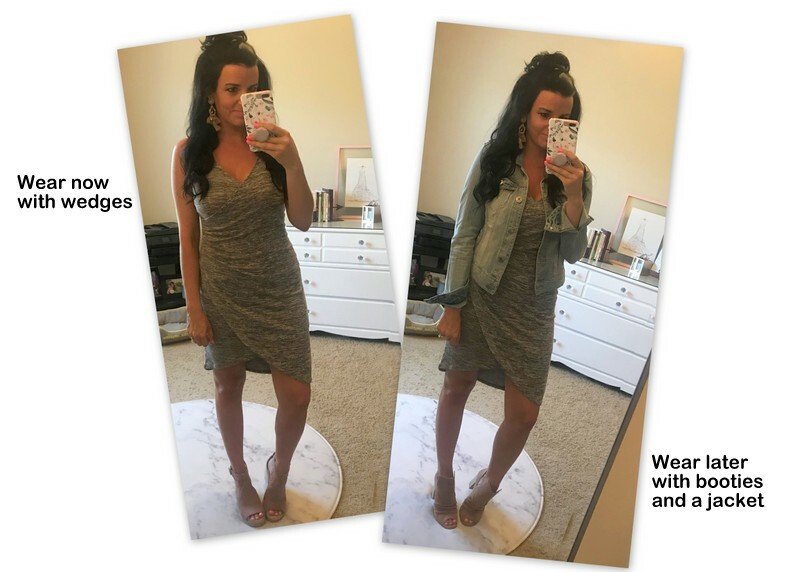 so I thought I would take a little time to share my try ons with you from the sale along with fit, sizing, and styling ideas. If you’re seeing things you like, here’s an “#NSale tip” – ask for gift cards for Christmas/birthdays and save them for the sale. I saved mine to shop with, and used a few notes I had saved this year, which helped me splurge on some things. Here’s an update on what I thought from my previous sale post on the things I ordered. 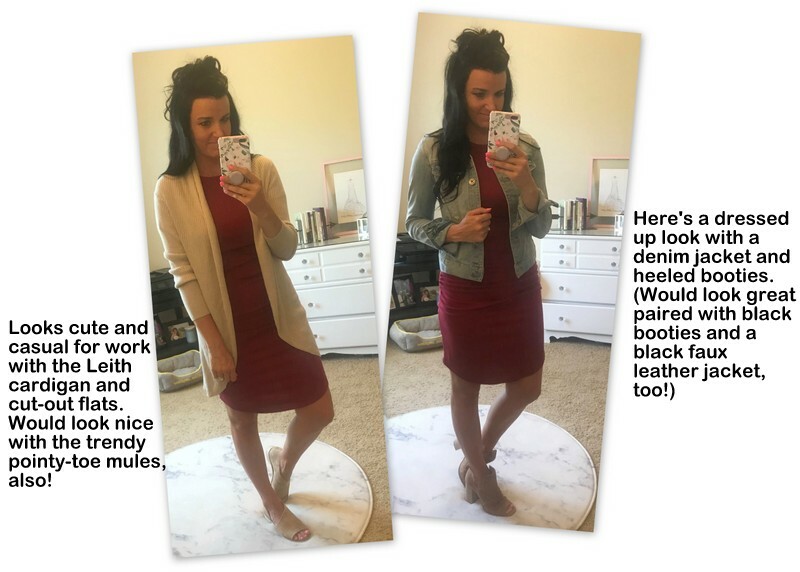 Peep Toe Booties or Pointy Toe Booties? Still trying to decide…. but probably the peep toe ones, or keep both?! They’re both so different. I got this rust-red dress instead of the sweater and lace top (above). Really happy about the exchange! Okay… I didn’t know what I would think of this dress, but it came, and I LOVE IT. I like that the v-neck is pretty loose, so could easily be pinned to wear more closed if you wanted. The ruched detail is flattering, and it’s a faux-wrap dress, which makes it very simple to wear. I like it by itself with my pink wedges and pink statement earrings, and can’t wait for fall/winter to wear it with jackets and booties. This wrap is such a statement! I wasn’t sure if I would like the high low hem, but it so fun and unique! I got it in the “pink smoke” color, but there are quite a few to choose from. The only thing I would say about it negatively is that the snaps seem a bit fragile in the thin fabric if you want to wear it in the wrap style. So, take care unsnapping it as I could see carelessness could cause future holes. I actually went in Nordstrom to return the things mentioned above that I decided against, and saw this dress. I was drawn to the color because I don’t really have much red in my closet. I tried on the small, which fit like a true, tight body-con dress. When I put on the medium, I liked the looser and longer fit, and felt it was much more flattering on my body. I’ll be able to wear it to work with a long cardigan or duster to cover my behind, and definitely on the weekends by itself or dressed up (shown below). When I shopped the sale two years ago, I picked up the popular Leith cocoon cardigan in a dark rust-orange color. I still enjoy pulling it out in the fall, and I see that they have it available in a similar color again this year. (I pulled my old one out for a photo to show you how cute it is over the wrap dress with booties.) This year I decided to get a more neutral color so it would go with more, and got it in tan. 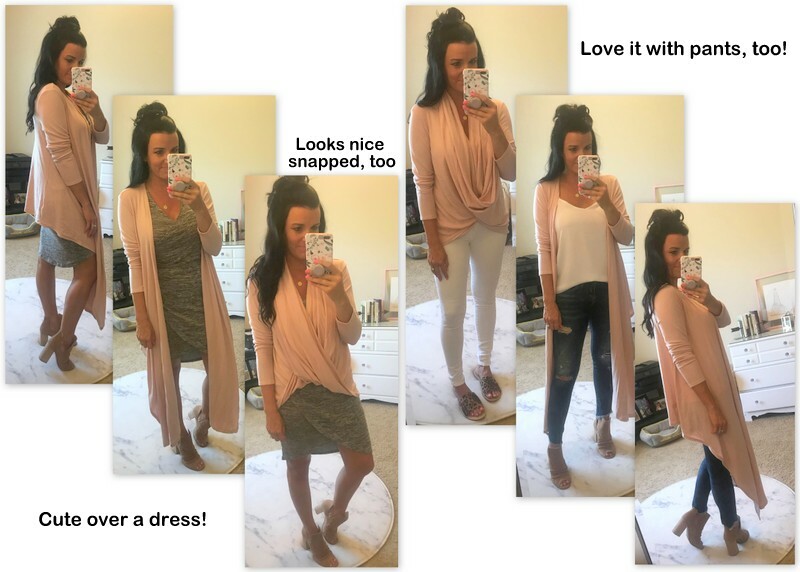 My top teacher picks are probably the cardigans as they can go over sleeveless tops and dresses to transition them into fall and winter. Here are other things I tried on and liked, but passed for one reason or another. The faux leather leggings just weren’t worth it to me – I don’t wear leggings enough. The coat is wonderful, but ran HUGE. The lace top ran large and was more purple than I thought it would be, so returned. The sweater fit VERY cute, but I liked this dress I saw in the store more, so returned it. LOVED the jeans (run TTS), but they’re spendy. So what do you think? I am so excited to repeat-wear these purchases by styling them different ways this fall and winter. Did you find anything? I’d love to hear what you got or liked! Thanks for the try-on session! 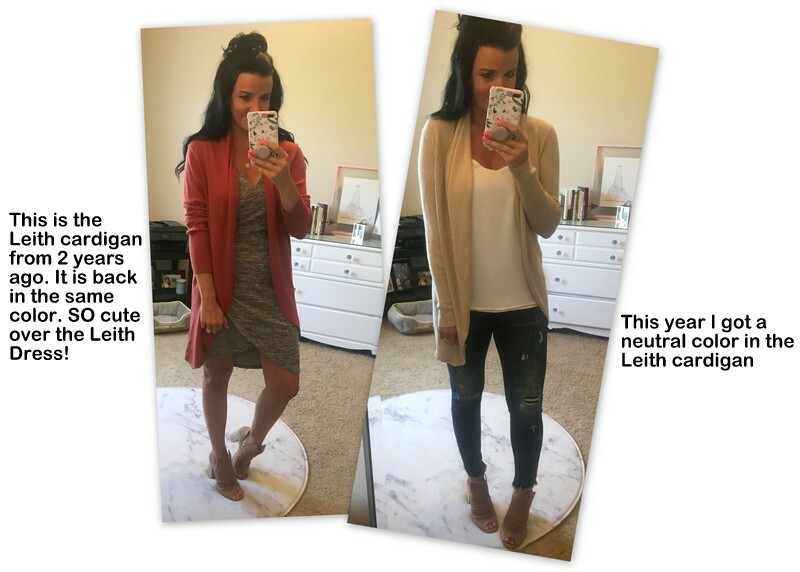 I’m a teacher too and bought the same Leith cardigan in rust last year. (I think it was last year) Anyway mine is so pilled I donated it. Do you have that problem? Do you have to shave it? Thanks for any info! Hi! Mine has pilled a little bit under the arms, and I do have a sweater shaver because a few of my sweaters do that. I have never dried it – always hang it flat to dry and wash it on cold on delicate, so maybe that has helped? The material of this year’s sweater isn’t as fuzzy, but I can imagine the same thing will probably happen. Hope that helps! Sweater shavers are a life-saver!